We welcome you in light and love. What a glorious day it is today. Open your heart and receive the love of All That Is and make manifest the light of who you are on the Earth today. Expand, expand, expand from within and glow with your light and love, sending it out all around you this day so all may know its glory. All beings will then feel and understand the light and love you carry within you, all beings will understand that which you are and bask in its glory. All beings will feel the love you emanate and in the doing so they will be filled themselves with God’s great love and light so they will be fulfilled within themselves. If you choose this today then your light will touch the heart of others and assist them to connect to their own love and light within. For whenever another being shines their light all beings receive this within and are supported to connect to their own love and light. It is the mirror of who they are. So we ask you all now to connect to your heart centres. Go deep within and connect to your heart centres, not your physical hearts, but the centre of your being that we call the heart centre. It is your temple within the place where you feel joy and peace, it is the place where all is calm and safe. Find this place within you now and sit within it. Illuminate it, activate it, and align yourself with it. Ask the mind not to create it for you because it is already there and it is for you to discover. Your mind cannot create this heart temple even though it may try to pretend it does. For in this space is a depth of frequency and light that cannot be created by your ego mind. It is the very Source of all that you are and cannot be replicated by your intellect, dear hearts. You will know this heart centre when you find it. It is an old familiar place for you and you have sat in this place many times; yet you have simply forgotten it. Discover it today as you read this. Make a choice to enter this place of light and love right now in your heart centre. At first, it may not be the bright light of which we speak, but just a dim light, but as you truly choose to reconnect more with your heart centre you will illuminate it greatly. This heart centre is the very centre of your inner being, the centre of all that you are. It is your Source. It is where your worlds are made manifest. It is the control centre of your great being, if you will. It is the driving centre of your consciousness. If you are disconnected to your heart centre then your ego mind is driving the being that you are, and your being is rudderless and without the power of its light. So we ask you to choose right now to go within, breathe deeply through the nose and then out through the mouth and discover this beautiful place within you. To make it easier, you may wish to connect to the cord of light that runs through the centre of your being – see this now in your vision. It is a cord of light that flows through the centre of your being. It connects to Source above you and to the heart of Mother Earth below. It is the channel for all energy to flow through your being. Connect with this cord now. See it above you connecting to Source/God/Goddess and then see it running all the way through your being and going deeply within the Earth connecting to the heart crystal of Mother Earth. Stand in this cord of light and simply ask to be taken to your heart temple. If you let go then you will simply drop like being in an elevator to the centre of your being to your heart centre and then you may alight and enter this sacred place within you. Sit in this place and expand your energy outwards to fill this temple. Keep expanding now. You are much greater than you think. Fill this place with your light and love. Feel the love of God/Goddess flow within you, then expand it outwards all around you. Feel the peace and calm of the now in this space. Sit on the floor of your heart temple and expand yourself outwards to fill the temple, then even larger to fill the physical presence that you are. Then expand even larger still to fill the energy field around you at least 3 metres or more all around you. Expand, expand and expand filling all with your light and love. In this space there will be no mind for it is impossible for the mind to operate in this expanded state. In this state there will only be your inner presence, your divine being of light and love. Connect now with this being and understand the greatness of all that you are. Understand now your infinite light and love. Understand now your infinite wisdom and divinity, understand at this time that you are truly infinite, a world without end. This is who you are. Understand that the illusion of smallness simply limits you in the third dimension. Choose to make manifest at this time who you are. Connect with your inner being and hand the driving wheel over to this part of you, surrendering the power of the mind and the ego now. Allow yourself at this time to disconnect to the limitations of the third dimension and feel yourself completely fulfilled and filled with the light and love of God/Goddess. Breathe deeply now and then ask what it is you need to know now, in this moment. Wait and listen for the response. You might wish to write this down so you do not forget it. Discover how to communicate now with your inner being so wisdom and guidance are yours. Sit with this experience and within it. Listen with your heart fully open and filled with the light and love of God/Goddess and know that this is what you are in all your glory. Be in the now of All that Is. As you sit in this divine moment you will feel yourself one with the slipstream of life itself and you will know the infinite glory of being One with All that Is. Is this not marvellous? We offer you this gift today and ask that you share this with others. Share your love and light as you walk each day with others. Shine your light forth, do not hide it, do not pretend to be something you are not. Instead, choose to be all that you are in every waking moment and do not be limited by the mass consciousness of the third dimension. You are here to shine your light through this mass and to illuminate all things and beings. Do this now with love in your heart and light in your energy field and share this with all. Know that when you choose to walk the Earth in your true being, life becomes a wondrous journey. We thank you and bless you in love and light dear ones. I have been lost for words of late, I just can’t seem to summon up the words to write a post, I have however been doing a lot of painting and drawing, usually following on directly after my meditations. During these meditations I have received strong visions, pictures so vivid that once I come out of meditation I start to draw or paint. So in light of my lack of written posts, I have attached a few of my most recent paintings for you viewing, amusement and or comments. So in light of my lack of written posts, I have attached a few of my most recent paintings for you viewing, amusement and or comments. Welcome, your beloved hearts this day. We come to say that it is not what one can see that is important .. it is what one cannot .. that is of the essence of all that is, dear ones. Life as you know it is but a minute bubble in the scheme of things. It is simply what you have created from this experience in the realms of matter, our beloveds. It is not the be and end of all, no surely it is not. We ask you to understand this and to choose not to be so entrapped by your creations in the physical world, dear ones. In this realm of physical matter, you often become so enmeshed in what you create as your reality and yet cannot see in truth past this creation with your knowing and wisdom, dear ones. You allow the reality of your creations in the physical realm to take you over and this is all you see. Your movie that was called the Matrix indeed showed you a perception of this and was not far from the truth, although it brought through your fears and distortions, placing you as the victims once again, dear ones. But we say to you this is not truth. For you are not victims of the Universe or some dreaded computer machine, dear ones. Many of you would prefer to let go your responsibility and believe this in truth, dear ones, for it brings ease to your minds and fears. And even those amongst you who know of the power of the light sometimes prefer to do this believing they are the victims of some other entity such as a wrathful God or beings from afar, dear ones. But in truth, this is not so. Yet many choose to hold this belief and create this as their reality for it is easier to create the understanding that they indeed are not responsible for their creations in this realm and are indeed following instructions of God or another being, dear ones. Why is this? For many prefer not to take responsibility for all that they create as their reality in the physical realm even your Prime Ministers and Presidents and Kings and Queens. Choosing instead to abdicate their Mastery to become the victim of outside influences. It is easier for them to believe that they have a mandate from a God that is directing them to go to war or to raise taxes or to ignore the minority for the better of the majority. Or, even dear ones to invade and war in countries for the highest good. Many of these things in your realm are done under the banner of God or faith or a higher deity than yourselves, dear ones. In truth, this is exactly what is occurring in your realm at this time, our beloved ones, as it has occurred so many times before. And in the doing so too do you, each one, also do the same as your presidents, kings and queens and choose to abdicate your Mastery and to give your power to a higher deity than you, a more powerful being then you or an influence outside of you. We say to you that the peace and harmony you seek in your realm, dear ones, may not arrive until you have realised that in truth you indeed are responsible for all your creations, dear ones. When you choose to step into your Mastery and accept and honour all your choices and creations as yours and accept the power each one of your beautiful souls have to create your reality in each moment through your own Mastery then the change will come that you seek. It begins with the smallest details of your own lives, dear ones, and like the ripples upon the pond it spreads out in a wave of energy to meet all hearts. All transformation needs to begin with yourselves, dear ones, and we ask you to choose to take responsibility for your thoughts and the energy that you create in all things in your reality. We ask you to taking responsibility for all that you are choosing to create in each moment with those around you including your loved ones, your co-workers and even with those people on the street you pass every day as you go about your daily routines. This is where the transformation is needing to begin, dear ones. Your Mastery of the physical realm asks of you to choose to take responsibility for yourself and all that you are choosing to BE, dear ones, and how this affects all you create in every moment. For you are indeed the creators of all that is in this realm, dear ones. Only you can create that which is in this realm, dear ones. The consciousness of God does not do this for you, our beloveds. Your God/Goddess is not the wrathful God of your dreams and storybooks, dear ones. God/Goddess does not take away your free will and keep you enslaved under his or her rule, dear ones. Nor does this consciousness decide what is best for you, dear ones, moment to moment. You are living in a free will zone on the Earth, dear ones, and this means that all you create is your responsibility. You are responsible for all that occurs in your realm, dear ones. We say to you that if it is not what you desire then we suggest to you that now is the time to choose to change it, dear ones. It is within your power. Yes indeed, you may call for assistance at any time, dear ones, for your divine highest good and you will receive this assistance from the realms of light and we will come to your aid to assist you to create in truth that which is for your divine highest good, dear ones. But in truth, we ask you to accept and honour what this means, for it does not always mean that you will win the lottery, simply because you have asked the heavens to do so, our beloved ones. If it is in your highest good for you to do so, our beloved ones, then indeed this will be granted should you so desire to create this energy unto you. But we say to you that in most cases we have found that many of you are not desirous of creating this energy to you even though you have asked for this to arise for you. We understand this is because you believe exactly the opposite to that which you often demand or request from the Universe, our beloveds. If this is the case for you, then that is what you will create as your reality because you will have already created the barriers and boundaries for receiving that which you ask for, our beloveds. We would ask you to consider this within yourselves. It is the same for those who have many riches and ask for happiness in their lives, our beloveds, without pain and hard work. In truth it is often the reason why they are never truly happy in their souls or why they indeed work so hard to retain their gold and coins. It is because they too believe they are undeserving of happiness in their lives or have the belief that it is truly necessary to work hard and drive oneself harder in all things to attain one’s goals for power and riches. And then there are many beings who truly believe it is their right to be rich, famous and powerful in all things in this realm and to retain that control over others. And this is indeed what they create in this realm. Yet as they hold onto all these things they are unable to fathom why it is their hearts still feel so empty, no matter how much power they control over others. This voice within them is still strong. They have chosen and created this for themselves because within them their being believes they are not deserving of being fulfilled and it understands that all that they create is not the driving force within them. It is for them to come to the Mastery what they search for and crave is not within their reach and cannot be attained through power over others, dear ones. All of these things are the challenges that your inner beings create for you so that you may awaken to your true selves. These energies are mirrors to you every day. These are the realities you are choosing to create to hide the truth of all that you are. Yet in every moment you are learning through these challenges you create for yourself in your life. Some of you awaken to them quickly and some more slowly. Each divine truth you are shown in your reality is only what you have chosen to create for yourself to understand the consciousness that is held within you that needs to be surrendered and released so you can be free of the shackles of your past that bind and hold you in your limitations in this realm of physicality. We ask you to honour, dear ones, that each and every thing you create in your life brings you closer to your divine truth. It is not another being, or outside influences that is creating these challenges for you, for they indeed are not the creators of your reality. It is your inner being that wishes you to see the divine truth that you hold within you. It is your soul, your higher self and your Divine Self that work with you to remove the blinkers from your eyes so you can see what is divine truth for you in this realm at this time. It is these parts of your being that hold the truth of all that you are. They know your Akashic records and all your experiences and the karma you hold. They in truth know what it is you seek and what it is you hold to yourselves and are unable to release or surrender. These higher conscious parts of you hold the knowledge of all that you have experienced over the eons in this realm and all others, dear ones. When you are choosing not to see then they will bring it to you in your life and ask you to look, dear ones. They have been the traveller and the creator of all that is in divine truth for you, dear ones. It is time now to awaken to these parts of your Divine Self and to listen to what they have to tell you so that you understand they are indeed the true creators of all that is occurring for you in this moment, dear ones. Open your ears and your hearts to your inner self and allow the ego mind to rest at this time for it does not understand this knowledge that your inner self carries within it, dear ones. The ego mind finds it so difficult to fathom past what is seen in the physical reality, dear ones. Simply allow this and do not expect more of your beautiful ego mind, dear one, than that which they can offer at this time. Allow the ego mind to rest for it has served you well, our beloved ones, and protected you well from the truth of all that is in their desire to please and assist you, dear ones. Call now for assistance from your inner being, your Divine Self, and sit with this part of you in truth, dear ones. Choose to open your ears to hear them and listen to their wisdom and their counsel, dear ones, for it is this connection that you truly seek in every moment. Do not be afraid of what you may discover, dear ones, for it is all in divine plan and it is truth in this moment for you. Surrender your fears and your expectations and allow yourself to be held by the inner being within you and become one with them in truth, dear ones. In choosing to do so you will surrender to the journey and all will begin to flow for you in your life. In so doing you will begin to feel you are indeed reconnected to All That Is and you will understand that everything that occurs for you is of your creation in this realm, dear ones. All your actions and thoughts are your responsibility, dear ones, for it is only you that creates these and in so doing it is only you that creates your karma. We ask you to observe and choose to understand the cause and effect of all that you choose to create in each moment. Be aware and conscious of all that you think in each moment and be mindful of this, dear ones, and how it affects All That Is. For this is the power you hold. Stand in the pool of all knowledge through your inner being and understand that everything you do and say and think affects the whole in all things, our beloveds. You are never alone and you are not a singular entity, our beloveds, for you are indeed part of the whole driven by your own inner selves to achieve all that you can be in every moment in this realm of physicality. You are here in this realm to do so and to become all that you are in truth through your experience in the physical world, our beloveds. We would ask you to consider that allowing yourself to become entrapped in the physical realm and the illusions of this realm is not serving your divine highest good or that of the whole, our beloveds. It only causes separation, resistance and more pain at this time – challenges indeed, our beloved. But we say to you these are challenges you no longer have to wade through if you so desire. For the choice to create them is yours, dear hearts. This is the assistance we offer you at this time, our beloveds, to tell you it is now time to let this consciousness go. The time for ascension is fast arriving in your realm of physicality and there is no longer the need for you to challenge yourself with pain and fear, our beloveds. Surrender this consciousness now and let it go. Choose to move through the limitation and separation energy that mankind has chosen to create in this realm, our beloved. Push through this consciousness of disconnection and separation and reconnect with the being you are in truth and choose to see that which is divine truth in this realm over your illusions, our beloveds. We say to you it is not so hard to do as you may choose to believe it is, our beloveds. It is only difficult if you choose to create it to be so for yourselves, our beloveds. It is only a challenge if you desire it to be a challenge, our beloveds. It is simply as easy as standing on the cliff and diving off, our beloveds. We will catch you, our beloveds, you will not fall and break on the rocks below. We will catch you and rise you up into the higher realms and the higher dimensions for this is our role to assist you in all things, our beloveds. This is why we are all here at this time to assist you in all things. To assist you to unlock the shackles of your limitations that hold you back from connecting with your inner being, your true Divine Self and to fly free of the illusions you have created in this dimension, our beloveds. It is time now to let go and fly. Be free. Blessings in the truth of all that is our beloveds. Blessings be. Namaste. Being a channel, a healer, and an empath; it is not always a life full of roses! Some days you just go with the flow, everything comes easily, your life is full of abundance, all you have to do is set your intentions on something and along it comes, your days are filled with love, happiness, and joy and you lead a compassionate lifestyle in the service to ‘Source’, Humanity and Mother Earth’. And certainly for me; I get many up days and also many down days! Some days I’m so tired I just want to sleep all day, even when I go to bed I’m constantly yawning, so much so that its hard to get to sleep as the tiredness is so overwhelming, I toss and turn as my being is filled with information, past lives flash before me, experiences are shown to me, connections to what I need to do tomorrow or in the future are paraded in front of me so I can recognise them when the time comes…. My head aches, I procrastinate, I multi-task without even realising I’m doing it, my tears flow like the flow of the Nile washing away the pains that are presented to me, people come and go, friendships come and go and relationships are a challenge at times because ‘We’ are difficult to understand. We try our best, we are loving and kind, we are considerate, compassionate and always available to all those in need…But and it is a large BUT….We are living in a human body and that takes its toll, we need to be loved, we need to love ourselves, we need like-minded people around us, we need Mother Nature so we can ground our energies, we need peace, we need kindness and most of all…We need understanding! Another one of my latest pieces of artwork, this one was created yesterday for my youngest daughters birthday. She, like many of us is always searching for her true self, for that happiness, the joy, the excitement, the ‘something’ that is already there, already inside; each and every one of us, and, it all starts with ‘Self Love’ and the understanding that opening our heart to ‘Source’, to ‘God’ to ‘The Power of the Universe’ (whatever you personally believe in) is the first step, then letting go of the ‘Past’, ‘Forgetting the Future’ and actually start ‘Living in the Now’…will lead us to that elusive ‘Something’, to the Happiness, to the Joy, to our ‘LIFE’. In Service To Others Helps Ones self ! Clearing ones mind, managing our thoughts, opening our hearts, having compassion for others and being in service to mankind, all beings and Mother Earth, all parts of the philosphies of Buddhism, the Darma teachings and the Eightfold Path. In a world like this this in which we live in, we most often become caught up in the importance of our own life , sometime even our own survival. We loose track of who we are, we loose track and forget that all of humanity comprises of our very own ‘Brothers and Sisters’, we push forward relentlessly, chasing the dream and forgetting the important things in life like humility, compassion, loving kindness and love for all beings. The following story talks about the importance of loving kindness, being in service to others and the benefits that these simple acts can bring to our lives. I do hope you like it? In former times in the jungles near Varanasi, a pheasant, a rabbit, a monkey, and an elephant lived in friendship and harmony. The four brothers declared that although their minds were harmonious, it was sad that in the world there was so little respect held by the young for the old. They decided to show respect for each other, according to the tradition of Dharma. Having made this determination the four animals set out to make offerings and pay homage. The younger showed respect for the older by carrying the older on his back. Standing on each others’ backs in this way, the pheasant, rabbit, monkey and elephant reached the first limb of the nyän dro da (banyan tree). The pheasant taught the others how to follow the moral conduct of not taking lives, not taking what was not given, not speaking deceptive words, not committing sexual misconduct, and not taking intoxicants. Then each animal led similar types of animals to themselves on the path of morality. Happiness and comfort increased greatly in the world. At that time, the king, his ministers, and the general population had the proud belief that the good times were due to their own merit. In order to determine who was responsible for the peaceful times they gathered together and asked a hermit to tell them the cause of their happiness. Through his clairvoyance the hermit explained that the countries’ wealth was not due to the power of any of the people but to the merits of the four animals in the forest who were keeping the five precepts of moral conduct and leading the other animals on that path. He advised them that they, too, should behave like these animals. Following this advice most of the people in that region began to keep the five precepts, and as a result, after they died, they were reborn in the deva realm. It is said in the Vinaya teaching Dülwa rlung and the discourse Do de nä kyang rlung that the pheasant was an incarnation of the qualified destroyer gone beyond Shakyamuni Buddha and the others were disciples – the rabbit was Nyi gyä (Shariputra), the monkey was Päl na kyä(Maudgalyana) and the elephant was Kungawa (Ananda). It is also said that wherever a picture of the four brothers is displayed, the 10 virtues will increase and the minds of all will become harmonious. There will be respect for elders and auspicious events will occur. At first, there was just the bird, and the tree was just a little sprout. The bird could scratch around on the ground and find little bits of plant to eat. The bird was unable to fly, so the bird could only eat what it could find near to the ground. As the tree grew, it became difficult for the bird to get enough food to eat. Then, the rabbit came. The rabbit would eat what was on the ground and would lift the bird up on his back so that the bird could reach the growing tree. In this way, they both had enough to eat. However, as the tree continued to grow, it started to become too high for the bird, even on the back of the rabbit. Then, the monkey came. The monkey could climb up into the tree and drop the fruit from the tree onto the ground for the rabbit and the bird. However, it was difficult to get to the fruit at the very top of the tree. Then, the elephant came. With the elephant, if all the animals helped each other, they could reach the fruit at the top of the tree; and, in this way, there was plenty for all of them to eat. The reason the four animals worked so harmoniously together and the reason they were successful is that none of them was primarily concerned with getting enough food for themselves. Each of them was concerned with trying to help the others to get what they needed. Rather than being dominated by selfish concern, they were dominated by cherishing others. Also, the reason they were successful is that they were willing to ask for help and to receive help. In this way, the bird is considered the hero of the story. The bird was the most fragile and needed the most help. Because the bird was willing to ask for help and because the others were happy to help the bird, everything worked out very nicely. In Tibet, in letters of advice to families who were going through some difficult times with each other, the Four Friends were often used as an example of how the family needs to stay together and help each other. Each member is very different and brings different strengths and different weaknesses, but if they work together, they can accomplish things they could never accomplish without working together. This story is a story of interdependence. It is a story explaining how there is no place for self-cherishing, but rather we need each other and we need to help each other. The worst thing is self-cherishing. This is a story about working harmoniously. What Story is Your Truth? Dear heart, we come to say to you that you are not your stories, you are the pure light of your soul. Yet how many stories do you run in your mind that create your reality and become your truth, dear heart? Stories from the past and expectations of the future, each one traps you in its tentacles and you make it your truth and reality in the now moment. Yet, we say to you these are simply stories, experiences of the physical realm, but they are not that which you are. These stories that you tell yourself are not the original blueprint of your being, but simply distortions you have created of this truth. Yet we say to you each story that you create will bring to you experiences and understandings on your journey to fully embracing the divine truth of you. Your stories come from many places, dear heart, often from your father and mother, grandfather and grandmother, your peer groups, and your collective consciousness. You choose to play these stories as your truth, yet in truth they are but your illusions and your distraction. Ask yourself dear one how many stories do you offer to yourself in your life? Do you understand how these stories control your reality and the way you perceive the life you are living in each moment of your existence? Your human mind loves the stories and it has many attachments to these stories that you run as your truth. Yet, we ask you dear ones, are these stories truly the truth of your reality, or are they the illusions through which you are choosing in each moment to live? When you run these stories you no longer live in the present moment, but simply live through the attachment of your experiences in the past or through an attachment to an expectation you hold of the future. And these may become great burdens and responsibilities that you carry, dear heart, which constantly drain all the energy you hold to live in the present moment in your truth and create your greatest potential. We would ask you, dear heart, to consider the stories that you are running and living as your truth. As you consider them become aware of what these stories are creating for you. Does the story you are running as your truth right now serve you, to live in peace and harmony or does it create drama and chaos for you? Is the story you are creating as your truth causing you to remain in struggle and limitation in your life or does it allow you to be fully present in the now and meet your potential? Does your story cause you to feel disempowered and in need of giving your power to another, believing that this other knows more than you and perhaps can see the truth of you? Does your story ask you to see the God of creation outside of yourself and separate to you, causing you to feel disconnected to the Source of your being and unable to hold the light of yourself firmly in your own heart? The human ego self is very attached to its stories and the drama and intrigue that is created through every story that you choose to live. It believes these stories give you the experiences of your reality, yet dear heart, how much does this serve you? Are you choosing to live through stories that cause you pain, struggle and suffering? And if this is true for you then have you asked yourself the purpose of this choice you have made? Do you understand, dear one, that your power lies in every choice you make and in each moment you can choose to change your story and live another experience? Dear heart, we say to you that the story is only the story. Your attachment to the story may be your greatest limitation in your experience of the human physical existence. Being trapped in an old story of pain, struggle and limitation may not serve you to expand, grow and evolve the consciousness of your being in the present moment. It may only hold you trapped in the past or the future. Often dear heart your ego mind chooses to attach to a story and play it again and again, even lifetime after lifetime because it judges the outcome that was created from that story. The ego was not happy or satisfied with the outcome of the original story and cannot accept it. Through the power of its will it chooses to change the outcome and so continues to play out that story over and over until it is satisfied. It may hold you enthralled for lifetimes in the same story replaying it over and over in many different ways searching to create a new outcome. When this occurs dear heart you replay and relive the same story in many ways trying so hard to create a different ending to the story that you cannot accept as your experience. We ask you, dear heart, have you not yet learned after so many experiences revolving around the same story again and again that the ending cannot be changed? This ending is the experience that you have been asked to master and learn. It is your Divine Plan. You are not being asked to change the story, dear one, you are being asked to accept this experience and the outcome that was created from it. Accept the ending of this story and learn what you are choosing not to learn. For in truth this is what you have come to learn in your mastery. We ask you to consider this, beloved heart, and to ask yourself why you are choosing to continue to relive this old story in order to change the ending that you did not like. How many times have you already relived and replayed this old story, only to discover that the ending is always the same? We say to you, dear heart, surrender to the Divine Plan. Let go your attachment to creating a different ending and accept with an open heart the experience of the original story and through this acceptance and embrace you may release your resistance to your mastery. Only in this way, dear heart, may you truly move forward and evolve on your path. For in the letting go and acceptance of what is in this experience may you truly be free to create a new experience for yourself and step more into your mastery as a co-creator in the physical plane of the Earth. Dear hearts, we watch you over and over again trapped in your stories and choosing to replay them over and over again. No longer present in the now but caught in your attachments to the past or your desires and needs for the future through your judgements and fear. Yet it is only in the present moment that you may know your truth and co-create through the power you hold. We say to you there are five original stories that live through the human psyche in the physical existence. Your beautiful ego minds have created billions of different versions of these five original stories because of your resistance to letting go your free will and surrendering to the wisdom of the Divine Plan. The five stories, beloved heart, include the first arrival of the soul consciousness into the physical plane of existence. At this time the soul feels like a newborn babe taken from the safety of the womb and feels great resistance to this. The soul consciousness may no longer feel the support of the living light of the Source heart (womb) that has nurtured it. In the voidal planes of existence, the soul is always held and surrounded by the Source consciousness just like a baby in the womb. When the soul first comes into the physical consciousness of matter it becomes aware that it is no longer held in the voidal waters of light and like the babe it cries out to return to this loving nurturing support. When it does not the soul feels the loss of this deep connection to the heart of Source and instead of going within to find the seed of Source that has been planted in its heart, the soul searches all around it for that connection, yet often cannot find it. This story is played out again and again in millions of different experiences in the physical plane beloved heart and is at the core of all stories of separation and disconnection that is held by humanity’s heart. This first story then births the second story that creates the belief that you have been rejected from Source (cast out) and are not good enough to be held in the voidal waters of Source light connection and cannot call it to you through the vast planes of light. The soul cannot accept the Divine Plan and refuses to believe that it is meant to be in the physical experiences on the Earth learning its mastery of co-creation. This is the first step in the soul’s free will in resistance to the Divine Plan. Through the second original story the soul consciousness has created numerous experiences of pain and suffering in the human psyche beloved heart. These are constantly played out again and again through the many experiences you choose to create in your physical realm. This in turn often creates the belief that you have lost your power and are disempowered on the Earth. In turn this also creates the belief in being the victim and unable to create a reality for yourself that will nourish and voidal waters of light. The third original story, dear heart, is the search for a replacement for the heart of Source. In this story the soul chooses to search for a new Source to nurture it and support it. The soul consciousness searches for this replacement in other souls, believing that their embrace, support and acceptance (what you may call love) will replace the memory they hold of the heart of Source. This original story has created trillions of experiences of ‘love’ and ‘conflict’ in your group consciousness, and has birthed all your books, songs and movies etc. as you began to sing and write of your experiences around this original story from the early times of your civilisations. The fourth story was birthed from the third and of course is the story of loss and disappointment. It is here that beliefs of distrust, betrayal, disappointment, expectations unmet, frustration, rejection and loss of faith are birthed when the soul realises that the replacement it has chosen for the heart of Source is not what it is truly seeking. In some way the soul comes to realise that this replacement cannot give it what it truly desires and so it believes it has been misled, or let down and it feels this loss deeply. The fifth story begins only when the soul understands that all the other experiences have taken it outside of itself and the answer does not lie outside of itself. When the soul realises that the answer is embedded deeply within its own being then it begins its journey to go within and look for the answers that it seeks. In this story the soul chooses to search for the heart of Source inside itself and proceeds to create many experiences around this story in its search for the seed of Source that is held within it. On this journey the soul is asked to look at all it has created in the physical plane of and around itself. This indeed may create many experiences of self-judgement and disconnection to the power of its light, as much as it creates experiences of reconnection to the light within the soul. In this way the soul comes full circle and begins to understand and accepts the Divine Plan. The soul understands that to know mastery of the physical plane it needs to create this in the physical world of matter. It is asked to become the observer of its creations and the witness so it can master the wisdom of its creations without judgment and resistance. The soul comes to understand that through the Divine Plan and all that it experiences on the Earth in its search for the heart of Source it discovers the power of its light and the truth of what it is. When the soul chooses to surrender to this it comes to know its Mastery and no longer needs to believe it is a story for it no longer needs to confirm who and what it is. Throughout each of these stories you are also learning about creation and your power to create in each moment the reality in which you live. As you live these original stories in the many experiences and permutations that you choose to create you are being shown the power of the light you hold within you to manifest your reality in each moment. Yet often because of these distortions to your original blueprint as a son and daughter of the God Source, you believe you must create alone and in separation to the heart of Source and the Divine Plan. And so, dear heart, you continue to create in disconnection, in resistance and without the support that is always there for you until you move into the fifth story and begin to learn to co-create with the heart of Source in your full power of the light you are. Each of these original five stories, dear heart, are played out in so many ways through the human psyche and cause you to create many experiences in your physical reality. Yet each one will eventually bring you back to the heart of Source within you. So we ask you dear heart what story are you running and playing as your truth right now? Have you chosen to live through your divine blueprint or is it a distorted story of your divine truth? Blessed be on your path to Mastery. Feeling Tired, a Little Lost and Deflated! I’m not sure about you but these days I’m feeling very tired, a little lost and somewhat deflated and I have no idea why! Over this past year or so I have dedicated my time to my own spiritual journey of self-discovery, I have connected with my channel, opened my channel pillar, connected with my previous lives, called in my aspects, settled old Karmic ties contracts and belief systems, dealt with many; many things that have held me back from reaching my full potential, and ,once again found and really connected with my own group heart, surrounded myself with and channels the teachings and codes from many Ascended Masters, Angels, Arch Angels, spiritual guides all whilst finding and really connecting with my higher selves and Divine Self…….Fantastic, yes!…..Amazing and uplifting experiences, yes!…..But now what? Fantastic, yes!…..Amazing and uplifting experiences, yes!…..But now what? Amazing and uplifting experiences, yes!…..But now what? Whilst I was going through this process, words came to me so easily, I could place my hands on my keyboard, close my eyes and my fingers would do the talking, words would appear on my laptop screen and I would be amazed at what I read at the end, I found myself connected to many projects, opened my heart fully to everyone and everything that needed my help. However, since I finished this process, I now feel lost, words are hard to find and I really feel tired and lethargic, somewhat at a loss with my humble human life and existence….! I think the answer is I’m integrating all that I have experienced, the codes, the languages, the energies and the frequencies I received during the year-long process are now being absorbed, finding their place in my physical form, allowing the information to connect with and to my human experience in this lifetime, and like a library book having codes associated with the process, the teachings and content of the learnings tagged on the cover for storage in my mind and ease of use when the need arises in the future!…. ………But as I was told by Saint Germain,……. “Dear One, all will come to you in the fullness of time, there is no time, time is but a word used by Humanity, so do not place your learnings on what you call ‘time’, you are a healer, you have always been a healer, and through this lifetime you are now blessed once again with the openness to re- connect with the knowledge and healing libraries within the many dimensions of all space and time; so that you can continue your learning and connect with the knowledge that your collective group heart is here to make manifest and bestow upon this earth, and for the benefit of humanity. Dear One clear your mind of all its obstacles, be at peace with yourself, open your heart to receive the light, the codes, the learning and the messages that are waiting for you, allow for this knowledge to enter into your light stream and ground this knowledge deep into Mother Earth, make it manifest and share it with all that come forth to you”. So my dear friends, here I am, feeling tired, a little lost and a little deflated but I know all will come good, I am still on my journey and I’m willing to be of service to mankind as is meant to be! 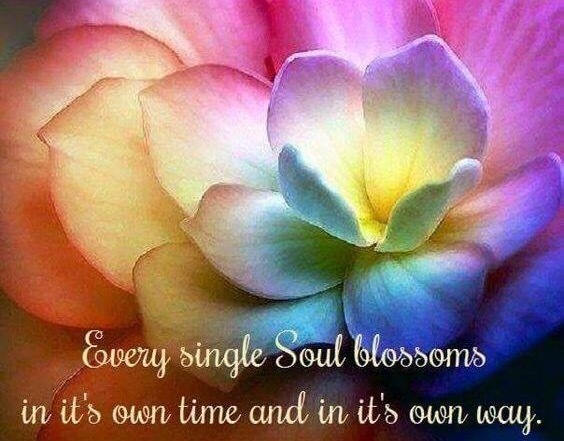 Every Single Soul blossoms in it’s own time and in it’s own way! ….Wow, how true is that statement? But, during this journey of my own self discovery, I too have pushed myself, allowed my Ego Mind and Free Will to conjure up stories and allowed them to question my journey, to push me once again to challenge my inner self , to challenge my beliefs, to challenge the speed in which I move forward , always there to question and place doubts on my abilities and to try and put a stop to my awakening to all that I am! We live in a world that contains all types of animal, some are downright scary and that includes humans too! But who are we as individuals to say which one has a right to happiness, to freedom, to love, to kindness? None of us is the answer! We are all beings of this earth and we all deserve a life without suffering! Today is the time to talk of love that which you talk about all the time. But what is love? Is it some kind of dream you have before waking up to find it is all an illusion? For many of you this may be true. But know this dear hearts – love simply is. Love is in everything you do and see, everything you touch, everything around you. Love is an energy of consciousness and not an emotion or feeling. Now let us be clear on this. We are not talking about love in terms of romantic love. We are talking about the energy of consciousness called love and this is a very different thing to your third-dimensional love. God’s consciousness is love, therefore it is in everything as God is in everything. But sometimes you can’t see it because you are seeking something else. God’s love is not about redemption, dear hearts. There is no redeeming here. God does not need to redeem anything from its love consciousness. This energy simply is as it is. God’s love is not conditional. It does not rely on an unspoken contract or agreement with you or another party to exist. There is no win win here. Many of you understand love as being a conditional thing. For you it is an emotion that can only exist if your desires and needs are met. I will love you if… you love me back, you give me diamonds, you support and nurture me, and on it goes. Such an endless list of wants and desires. This is not love. This is an agreement based on an emotional response. Yet this is the love you exchange with each other every day. With all your “loved” ones – mothers, fathers, children, lovers, husbands and partners, friends and acquaintances. Love is not the emotional experience of highs and lows. Divine Love leaves its wondrous energy around you and offers peace and calm, an acceptance of all that is. Love lives in the moment, it is not something that has to be recalled from the past or sent into the future. It just is. Divine love, dear ones, asks nothing for or of itself. It does not require agreements or exchange to exist, It just is. It is always with you, yet sometimes you are unable to see it because you are so caught in the web of your emotions and beliefs about what love is. These emotions will distract you from many things and from seeing that which is right in front of you. It really is not so difficult. It is simple, dear hearts, so we ask you to avoid making it so complicated. It is easy to connect with the divine consciousness of love, avoid making it so hard for yourself. Allow it to flow in your heart and mind. When so many of you call for love, saying I want some love in my life, some happiness, you are not calling for God’s divine love you are calling for someone else to fulfil you and walk with you on your path. You are asking that someone else give you the ‘love’ and nurturing you feel you are unable to give yourself. Love is not a contract, beloved hearts. Love simply is. This love you speak of in your physical realm does not fulfil you, which is why so many of your bondings and relationships end up in sadness and tears. This is because your contracts have not been fulfilled. Whenever you have made silent agreements with others you will always find disappointment because no other can fulfil your needs about yourself. Only you can create your life, dear ones. In the same way you cannot do someone else’s path or journey then accept that another is unable to do your path or journey. The responsibility for your path and your experience here on Earth lies with all that you choose to create for yourself. We are not saying to avoid relationships with other beings on the Earth, dear hearts, this is not so. We are saying that when you have opened your heart and mind to receive God’s love within yourself you will see it and recognize it in everything and everyone else. When you choose to open to this, then your relationships will be supported by this energy of love – unconditional love. All will be in every moment in peace and harmony with everything else. The emotions will not need to be fed and feelings such as fear, judgement and anger will have no cause to arise. There will be no agreements in your relationships with other beings because you will love unconditionally all beings. You will also not feel you are separate or alone, dear ones, because you will feel as one with all beings and all things. You will see that you are never alone. You are always uplifted and supported by other beings. You will understand you are a beloved child of the universe. Now, we say to you dear ones, to see and understand God’s love appears to be an impossible task for many in the physical realities you are choosing to create on the Earth. But in truth this is what you seek in every moment. You seek this fulfilment because deep within you know it exists because you have felt it so many times before when you have chosen to open your heart and mind to receive from the heart of Source. The path to God’s love is not so difficult, dear ones. In fact, it can be an adventure. Think of it as fun and a game. To see God’s love in every waking moment is simply a matter of making a choice each and every day – choose to see God’s love all around you. Release all emotions as they surface within you and let go all beliefs of separation. As you feel your emotions and thought forms them bubbling up announce them out loud to yourself and honor them. Become conscious and aware and then choose to release them to God. In this way, dear hearts, your emotions and thought forms will not cloud you from seeing what your divine truth. Choose to live your life in harmony and create balance in your four bodies – mental, physical, emotional and spiritual. Live not in the one over the others. Understand that you do not have to seek God’s love nor do you have to try and create it, for it is always with you. You only need to lift the veils of your mind and heart and you will see it and feel it. When choose to walk consciously in God’s divine heart then you will find all that you seek. Blessings on your journey into the one heart of love. The tides of energy are turning and changing right now on the Earth as we begin to step into the new age of evolution for each soul. We are being called to lift our consciousness and expand our hearts and minds and, as the many rays of light flood the planet to support us in this endeavour, there is still much resistance to this new way of being in the heart of humanity. We are still choosing to play out the old karma that is held within us before we resolve it and become free of the bonds of our attachments. As a collective of souls, hu-mans are beginning to move into a new phase of becoming all that we are and we are opening and changing the consciousness of our being. This is a process of growth and adaptation as we transform the old into a new way of being. It is the alchemy that is occurring between the ego mind and the higher consciousness as they begin to reconnect and it will bring many changes to the individual soul as well as to the collective. This is occurring for everyone across the planet and many can feel it. Yet we are being asked to hold patience in our hearts, for patience is needed as we move through this process. It cannot be speeded up to suit your impatience, dear heart, all will flow as it is needed. We are also being asked to let go of the consciousness that creates separation in our minds and hearts and to allow all in the collective to play their part and bring the gifts they hold to the group heart so all may grow through all they have come to learn. The Earth too is shifting and this energy is creating chaos and change across the Earth for many people. Yet remember that out of chaos comes amazing rebirth and regeneration. For new growth change and destruction is often required and the Masters ask us not to be so sad about this. It is what is, our beloveds. When the chaos causes death and destruction the Masters ask us to understand that all those who leave their bodies do not truly leave us, they are simply changing and shifting their reality from the physical to another vibration or way of being and their soul knows this vibration well. As this shift is created for them they will rejoice in this new way of being and move forward on their journey. Celebrate and honor their new vibration of energy. The Masters tell us that the Earth is growing and her womb is turning and getting ready for birth. This transformation will continue for some time until she is ready to ascend, yet these Earth changes will create more change of consciousness for everyone who stands on the Earth in all their forms as all are needed in the group heart to support this new creation in the Universe. The Masters ask us not to be afraid, for all is as it is, our beloveds. They ask you to hold the love in your heart and allow the energy of the pure light to pulse through you. Whenever you feel afraid they ask you to call to them, the angels or your guides and allow them to assist you and hold you in sacred space. Open your hearts to receive the support that is there for you. Choose to open up your hearts and allow the Light to flow through you and when you have received it fully then send it out through your open heart to all beings on the Earth who feel they are suffering. Send your love out to these ones and share with them the light rays of your heart. Every time you hear of chaos and change on the Earth or feel people are suffering anywhere, choose not to close your heart and berate those in power or those responsible for creating this chaos. Simply open your heart and allow the light rays to flow through you. Channel them using your breath from your crown chakra and send the light to your heart and then out to all people who are suffering, as well as those you believe to be the perpetrators and are wishing to blame. Send pure light instead of blame and anger. There is no one to blame, our beloveds. There is nothing to blame, our beloveds, all is as it is. The Masters ask you to accept this and call upon the light to flood through you and send this love and light out to all who may only see the suffering and pain, send the light out to all who can only see the darkness. Share with them the light so they may stand in the Light of Source even as they believe they are suffering. Assist them to connect with the light of Source so they may know its transformational power and its ability to cleanse the spirit of the illusion of physical matter. Allow this to flow through you in every moment, our beloveds. Every time you hear or see anything that makes you feel fear in your heart or sadness and pain, the Masters ask you to call to the light of Source to flow through you in this very moment. Choose to not step into the illusion. Call on the light of Source and allow it to flow throughout your being so that you may then share this pure light with others on the Earth who have walked into the illusion of pain and suffering. Do this, our beloveds, and the illusion of darkness will change to light and love. Do this, our beloveds, and your hearts will open and sing. Do this, our beloveds, and love will pour forth from you in a golden ray of hope and joy. Do this, our beloveds, and the world will change and be as one with Source in the one heart of All that Is. Do this, our beloveds, and you will know peace and joy. We love you. The Earth from the Hubble Telescope, What a Delicate Place we Live In! I came across this wonderful picture today taken from the Hubble Telescope and after looking at it for a few minutes, It looks like the world is being held in the loving embrace of an Angels wings, which then got me thinking just how delicate our world is and how we need to do something to protect it. I have written about our environment many times, however, like many who write on environmental issues; most readers think it will be all sorted out for them, someone else will make the effort to stand up and be counted, someone else will go out and clean up their local area, someone else will go on a march re climate change or pollution to our environment. So many people look at the news and see the devastation that is happening to our environment all around the world, oil spills, water pollution, fracking, toxic waste dumping, but very few people will actually do anything unless it happens on their doorstep, and I mean on their doorstep, most people won’t even do anything if it happens in their country, their county, or their city…. so unless it’s on their doorstep; they just turn a blind eye and say, ‘ it’s not my problem’! However, it is our problem because to use the following example, the terrible radiation leak from the Tsunami hit Nuclear plant in Japan is now polluting the oceans of our world, millions of fish, Whales, Dolphins and sea creatures in the Pacific Ocean are dying because of this natural disaster! So, will you do anything if all of a sudden you cannot eat any fish from the ocean? or You cannot go into the ocean for a swim when you are on holiday in the Philippines, Thailand, Indian Ocean, Australasia, West Coast of America, Hawaii, Chile, Argentina, Mexico etc? I wish we could lift our heads, take notice and take ownership; because we are ‘ALL’ part of the problem (as consumers) and we are all capable of doing something about it, we can stop buying goods that pollute our environment, we can stop using plastic bags, buying plastic bottles of juice, water etc, we can source from more environmentally friendly companies, we can join a local clean up group, we can sign a petition to save our planet, there is so much we can do to make change happen, but as long as we say ‘It’s not my problem’ then we will NEVER make CHANGE HAPPEN! We live on a beautiful planet, that looks after us each and every day, now my dear friends, it’s our turn to do the looking after…. Wow!…I have always had problems with this statement.. ‘Surrender to Receive all that you Need’. Like many, I have been travelling my own life’s journey and to date that’s about 55 years and 210 day’s to be precise in my case 🙂 and I still have trouble with the letting go, the surrender of the past! The past is the past and it should firmly remain in the past. The future is the future and it should firmly remain in the future. The only thing we have for sure is ‘Now’, the present moment, all that we do, ‘EVER’ is in the ‘Present Moment’, so why do we waste so much time thinking of the past and worrying about the future?…Our previous life experiences, good or bad; play perfectly into the hands of our Ego Mind, adding fuel to the Ego’s fire and allowing it to hold us hostage with previous life experiences especially if the were bad, caused us trouble, held us back etc. And the uncertainty of the future, what it holds in store for us does exactly the same thing, allowing our Ego Mind to take yet another opportunity to cause us grief, ‘Your not worthy of that, you will fail at that, “Remember when you did that before and it caused you this problem? ‘so you had better not do that again’…and on and on these old thought patterns control us. Memories are good and they allow us to equip ourselves as we move forward but we do our lives a major injustice when we allow our Ego Minds to control who we are and from reaching our full potential. Living our life in the ‘Now’ is perfect when we read about it in books, listen to self-help recordings, attend seminars, training programs and self-help groups but the reality is like the never ending diet, we try, then try, then try and try again but we just can’t stop that Ego Mind, that little demon on our shoulder from saying, “Watch out for that”, ‘Don’t do that”, ‘Remeber what happened before”, “you will fail at that”, “you will never loose weight”, etc, etc, etc, So in my opinion, and for what it’s worth my advice is……. “Stick With It”…..Meditate often, everyday if you can, break free from what holds you back, from what ties you down and ‘Just Be’, ‘Just Breathe’, connect with your inner self, meditate and go into your heart, love yourself for what you are ‘Now’ and for what you ‘Have in your life now’, be grateful for all that you are and ‘Just Be You’, let go of all the pressures that surround your day and ‘Let Go’ to ‘Receive something far greater than your own plan allowed’ and you will find ‘Peace and Love’ because my friends, they ‘lie within’.